So, what is the best LiPo charger? 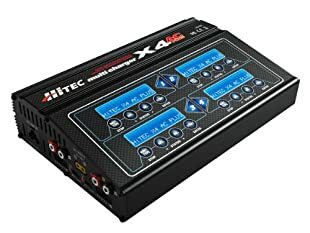 My advice would be to go with the HiTec 44167 X4 AC Plus 4-Port AC/DC Multi-Charger. This checked all the checkboxes for me and for just a bit more money seemed vastly superior than the alternatives. I use this connected to an AC outlet at home and while flying connected to my car battery. It charges four batteries at a time and is built like a tank. Each port of the X4 AC Plus can handle up to a 6S Lithium, LIPO pack, 15 NiCd/NiMH cells or 6-12 volt lead acid batteries. Four individual balancing ports eliminate the need for a separate balancer when charging Lithium batteries. Its twin fan cooling system with an internal sensor for controlling fan speed provides the utmost in efficiency and safety. It’ll discharge battery, charge them for use or for storage, balancing the different cells effectively. 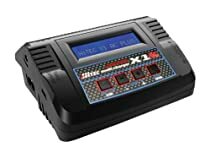 Why shouldn’t I get a cheap LiPo battery charger? I know many will say it’s out of your budget, but in all honesty it really is something that you shouldn’t scrimp on for so many reasons, the main one being safety. This charger has already been adopted by many, you really want to just be able to buy a unit that does everything adequately and safely and be done with it and not have to upgrade again. Not all chargers are equal, and cheap Chinese crap from Hobby King should be avoided. Get a charger from a known brand that has a good reputation such as Hitec. How fast can I charge LiPo batteries? How long it should take you to charge a 4000 mah pack ? Well you should have something that is capable of matching the capacity in one hour, so something that can charge at 4000 mah, also referred to as 1C. Although you can charge some packs quicker I don’t recommend it and obviously the cost of a charger that is capable of that will go up considerably. If you want a charger that is going to charge your packs at 1C it’s not going to be a super-cheap item, and the ones that can and are cheap I would tend to avoid. You really want a digital charger that will tell you what you are currently charging at, what the internal resistance of your pack is, should have excellent balancing capability and also allows you to charge/discharge for storage. 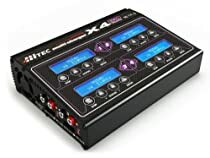 Good and cheaper (but not cheaply made) alternatives exist, the HiTec 44165 Plus Single Charger which charges one battery on AC or car battery and the HiTec 44169 4 Port Multi-Chemistry Charger which will charge 4 simultaneously but only on an AC outlet.